Fitec valve pumps product line includes KV Ball Valve Pumps, KP10 gate valve pump and more. Fitec pumps are reliable and efficient with highly abrasive organic waste, high-solid and highly abrasive materials, like sand, stones, glass and metal fragments. Fitec valve pumps product line includes KV Ball Valve Pumps, KP10 gate valve pump systems and more. FITEC KV Ball Valve Pumps are characterized by a very simple construction and are therefore less susceptible to interference. This applies especially to highly abrasive organic waste since Ball Valve Pumps contain no rotating parts. The KV20 is hydraulically operated and, depending on the required flow rate, available with one or two cylinders. The KP10 piston pump is designed to pump the toughest and highest wearing applications. Use this pump when you need to move slurries that are hot or full of highly abrasive materials like sand, stones, glass and metal fragments. 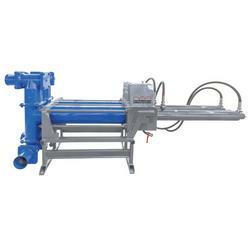 Pumping is performed by alternately opening of the valves. While the hydraulically driven delivery cylinder is moving forward and backward the substrate is drawn into the pump through the inlet valve and pressed out through the outlet valve. This pump is ideal for slurries produced in organics recovery and recycling operations, after the pre-treatment of source separated organics as well as biosolids and various other substrates and sludges. The KP10 includes a hydraulic power pack and a control cabinet. Settings and performance adjustments can be controlled remotely from any internet-ready device.